Home / ECCLESIAL MEDITATIONS & THEOLOGICAL ARTICLES / Dr Guy Freeland / THE LABYRINTH – A CHRISTIAN MANDALA? Minos, King of Crete, set off to Athens to seek redress for the death of his son. While he was away, his wife, Pasiphae, fell madly in love with a bull. (These things happen even in the best of families.) 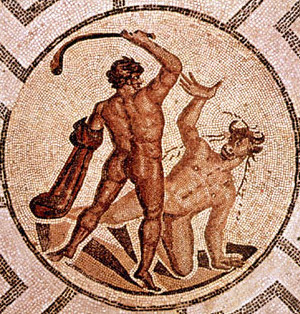 The fruit of this union was a monster with the body of a man and the head of a bull, the Minotaur. 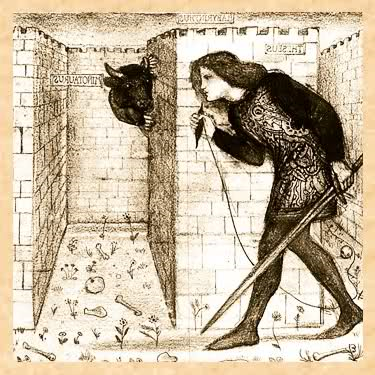 On his return, Minos commissioned his architect, Daedalus, to construct a labyrinth, a building with such an intricate complex of passageways that, once imprisoned in the centre, the Minotaur would never be able to effect an escape. The penalty imposed on Athens was a tribute, payable every nine years, of Athenian youths and maidens. These young people were fed to the Minotaur. Came the year when the lot fell to Theseus, son of Aegeus King of Athens, to form part of the tribute. 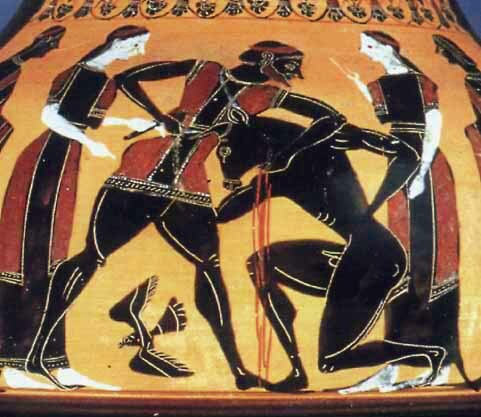 Theseus determined to kill the monster, but how to get back out of the labyrinth? Minos’ daughter, Ariadne, being a bright girl, solved the problem by giving Theseus a ball of thread which he could unravel as he penetrated the labyrinth and, having slain the monster, follow back to the entrance. Job done, and the lads and lassies the Minotaur hadn’t eaten for brekkie released, Theseus set sail for Athens, stopping off en route at Delos to give the first performance of the labyrinthine geranos, the crane dance. The Church has always used pre-Christian myths and legends as types (foreshadowings) of episodes in the life of Our Lord, antitypes, in much the same way that it uses narratives from the Old Testament. This is possible because it is not the content, the story line, or historicity of the type that matters in typology but the structural identity and deep underlying spiritual meaning it shares with the antitype. It requires little imagination to see how Church Fathers could readily take Theseus as a type of Christ and typologically interpret the myth in a variety of ways. The most basic interpretation would see Theseus’ journey into the labyrinth and slaying of the Minotaur as a type of Christ’s descent into Hades, conquest of Satan and release of the imprisoned souls. The labyrinth of this our life cannot be threaded by the faculties of human nature unless a person pursues that same path as He [Christ] did who, though once in it, yet got beyond the difficulties which hemmed Him in. 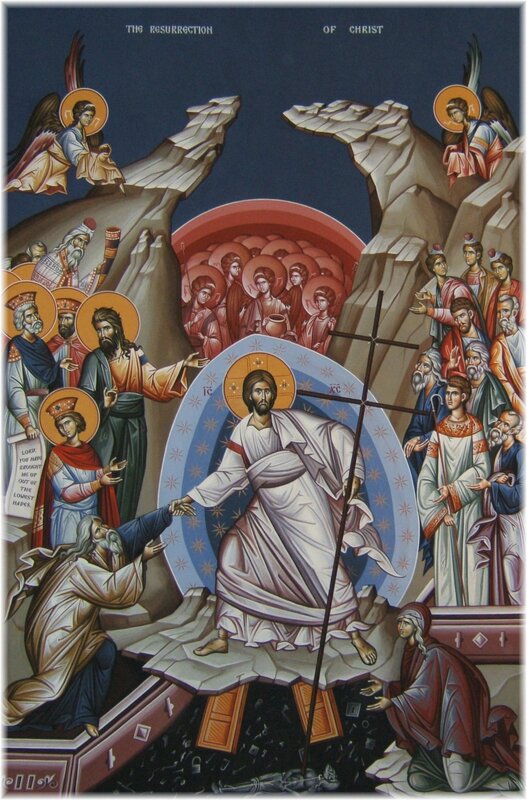 For Gregory, to follow Christ-Theseus along the pathway through the labyrinth to eternal salvation necessitates repentance and regeneration through baptism (a sacramental antitype of the Paschal Mystery of the Lord, which, in its turn, is an antitype of Theseus slaying the Minotaur). The Fathers construct a polar opposition between the actual labyrinth of life, with its many bewildering junctions and crossroads and where it is all too easy to end up down a dead end or follow a one-way street to perdition, and the single pathway to salvation threaded by Christ. As we shall see, this opposition generated two different representations: those with many diverging paths, known as multicursal labyrinths, and those, though possessing frequent turnings, with a single pathway, known as unicursal labyrinths. 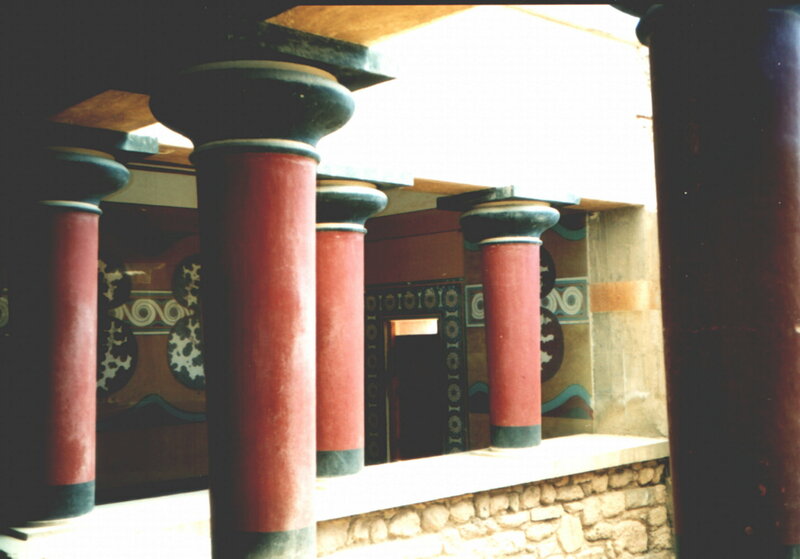 The British archaeologist, Sir Arthur Evans, the excavator of Knossos on Crete, thought that the origin of the myth might lie in the maze of passageways in the palace. Attention was also drawn to frescoes, which might connect with the myth, depicting a ritual in which agile nubile young ladies vaulted over charging bulls. Whether or not the palace was the original labyrinth, there seems no doubt that there was a building known as the labyrinth in Egypt, an enormous complex of halls and temples threaded together by a confusing web of passageways. without an exit and envelopes the wretched race of humankind. Medieval Christian depictions of the Cretan labyrinth, as well as Greek and other Ancient visual representations, seem all to be unicursal. 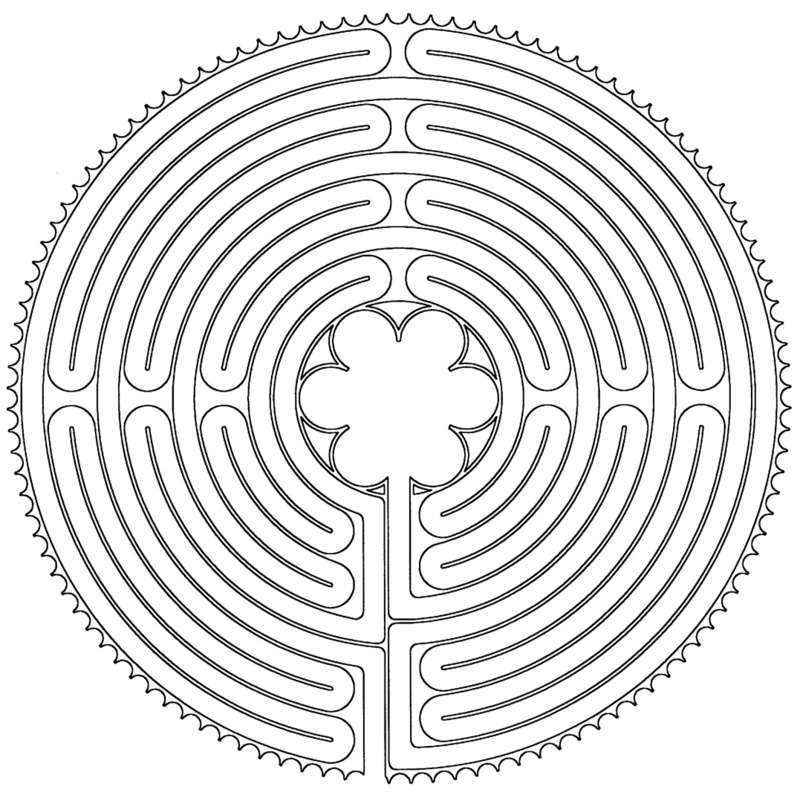 The multicursal maze (“labyrinth” and “maze” are usually used as synonyms) only came into their own with the Renaissance and Reformation, in the form of the garden hedge maze. Although garden mazes were constructed for amusement and exercise – and were popular for providing hidden trysting-places for lovers – they nevertheless conveyed a moral message. Traditional Catholic/Orthodox theology stresses the necessity of the doctrine, spiritual counsel and mysteries of the Church in guiding the Christian along the path threaded by Christ-Theseus to salvation. Protestant theology stresses the responsibility of each Christian to discover their own path to salvation, guided only by the direct voice of the Spirit and the Scriptures. The many junctions of pathways of the maze represented the many moral choices that must be made in working out the way to salvation. It is as easy to become totally lost and confused in an intricate hedge maze as it is in the complex of pathways and blind alleys of life. 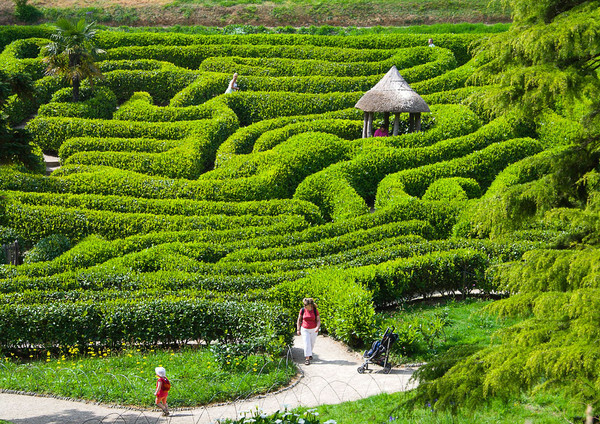 I well remember getting seriously frustrated trying to get out of the diabolical hedge maze (1833) at Glendurgan, Cornwall (illustrated). Had I not found a hole in the hedge, I would probably still be imprisoned there today. It is not surprising that Fathers of the Church could refer to Hell as a labyrinth. Pavement labyrinths marked out in mosaic made their appearance in Roman times. These labyrinths were unicursal and divided into four sections, through which one travelled in sequence, and probably symbolised the four corners of the world, the four seasons, the four ages of human life, and so forth. This kind of Ancient labyrinth made its way into the Church. There is a surviving fourth century example of this form in the church of San Reparatus in Orléansville, Algeria. It is probably from such Roman labyrinths that the classic pattern of the Church labyrinth evolved. The surviving tile labyrinth (c.1200) extending some 40 feet across the entire width of the nave of Chartres Cathedral, near Paris, is usually taken as the paradigm of Church labyrinths (see plan). Few remain, but pavement labyrinths were once common (we know the plans of a number now destroyed) particularly in Gothic cathedrals and large churches in France. The pattern also appears on walls and in manuscripts and early printed books. A fine medieval example, with accompanying inscription, is engraved in miniature on a wall of the exonarthex of Lucca Cathedral, near Pisa, Northern Italy (illustrated). 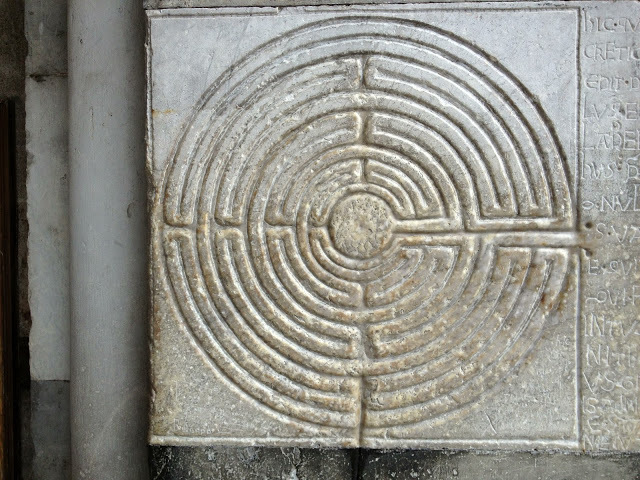 While the concepts encompassed within the medieval Church labyrinth might well have originated in writings of Eastern Fathers of the Church, the Church labyrinth per se seems to have been a Western development. From the East, I can muster only one example. I have seen a photograph of such a labyrinth painted on a wall of a Meteora monastery. However, I have also seen an illustration of an eighteenth-century Russian icon depicting a circular multicursal labyrinth. 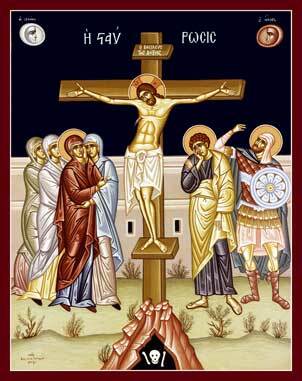 If any reader knows of other Orthodox examples, drop me an e-mail (GuyFreeland@bigpond.com). 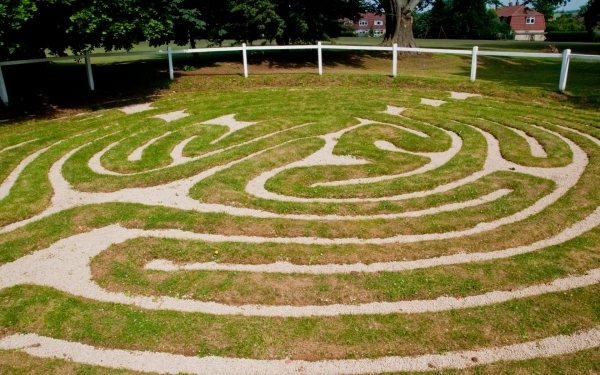 In England, pavement labyrinths seem not to have been constructed in churches; instead, labyrinths with closely similar or identical patterns to that of Chartres were cut into turf (illustrated is the turf labyrinth at Wing, Rutland). There is as yet no scientific way of dating turf labyrinths, but there is no real doubt of their medieval origins. There are few literary references, but one does occur in Shakespeare’s, A Midsummer Night’s Dream. I had actually seen the famous labyrinth of Chartres as a child, but the labyrinth only really entered my life through an encounter in 1978 with the presumed medieval “Mizmaze” at Breamore, Hampshire. Today, labyrinths are all the rage and children are kept busy by Sunday school teachers, and those splendid lady vicars, constructing them in churchyards across the length and breadth of England. But back in 1978 very few people knew anything about them. I hadn’t even heard of turf labyrinths until I stumbled across the Breamore Mizmaze. My Labyrinth was circular and of the Chartres pattern. It had a diameter of some 70 feet with a low mound at the centre. But what on earth was it? Contemplating the design, I was impressed by its beautiful intricate geometry and the fact that the pathway inscribed a cross within the circumference of the labyrinth. I set off to “tread’ (since that is what one does in labyrinths) the grassy pathway to the central mound. Looking at the pattern from outside, it was the harmony and geometrical elegance, even in a sense simplicity, of the labyrinth which struck me, but from within simplicity gave way to confusion. One moment the path took one in very close to the centre, one’s destination (trace the diagram with your finger), next moment one was propelled to the periphery. The meaning of the labyrinth began to dawn on me. Clearly, it was an image of every person’s pilgrimage through life, with its frequent stumblings and turnings (the Greek word for repentance, metanoia, means turning around from sin). The spiritual life is punctuated by ecstatic moments when one feels close to God (= the centre of the labyrinth) but also periods of dryness when one feels deserted by God (= the periphery). Within the labyrinth one cannot tell how far along the pathway one has progressed. The labyrinth teaches that what is demanded of the pilgrim is persistence to follow the path threaded by Christ-Theseus. If we tread the Way with Christ, as Luke and Cleopas did on the road to Emmaus (Luke 24:13-35), no harm can overcome us in the multicursal mizmaze of earthly life. I reached the mount spiritually enriched by my experience. But surveying the whole pattern again another level of meaning was revealed, a cosmic level. If one ignored the turnings and joined up the sections of pathway, the labyrinth readily transformed into a nest of eleven concentric rings (try it) forming a diagram of the Ancient geocentric cosmology. I was standing on the earth, so the eleven rings could represent the three rings of matter surrounding earth (= water, air and fire), the seven planets (= the five naked-eye planets plus the sun and the moon) and the sphere of fixed stars, equated with the primum mobile (= the source of motion of the cosmos). So, on one level the labyrinth is a model of the Ancient cosmos, on another the key to the mystery of every person’s pilgrimage through life. In other words, the labyrinth is what the Buddhists call a mandala (there seems to be no equivalent Christian term). So much for my experience of an English turf labyrinth, but let us get back to the pavement labyrinth in medieval churches. Clearly they could have been understood in all of the ways I have noted. There is, however, abundant evidence that they were also seen as tributes to the architects of great churches, since images of architects were sometimes depicted on them, as at Amiens. 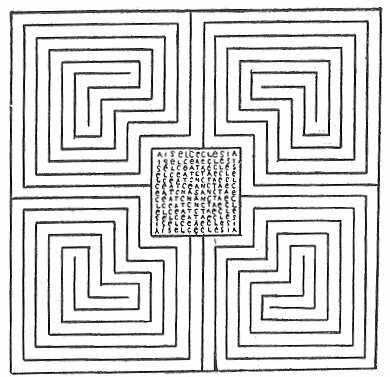 The reason is that the labyrinth represented the Cretan labyrinth and, although two-dimensional, was thought of as a three-dimensional building. According to the myth, the Cretan labyrinth was the work of Daedalus, traditionally held to be the greatest of all architects (significantly, a common French word for a labyrinth is dédale). Associating the labyrinth with the architect(s) of the church was thus a declaration that their skill was comparable to that of the greatest architect of Antiquity. Even God, the (metaphorically speaking) great architect of the cosmos, was sometimes conceived of as a divine Daedalus. But how were the Church labyrinths actually used? Well certainly they were not, as has been surmised, traversed on one’s knees as a penitential act or as a substitute for the pilgrimage to Jerusalem. However, we do have evidence that they were used as the setting for a liturgical dance at Easter. The only surviving account of the ritual is from Auxerre Cathedral in France. After Vespers on Monday of Bright Week a large ball, called the pilota, was passed back and forth between the Dean and canons (= the Cathedral clergy) as the Dean performed a tripudium (= a religious dance) at the centre of the labyrinth and the canons danced circa daedalum (around the labyrinth). Probably the canons danced along the pathway rather than just around the circumference of the labyrinth, but the text is unclear on this point. studies at St Andrew’s Greek Orthodox Theological College. Source: Greek-Australian Vema, September 2007, pgs 8/26 – 9/27. On behalf of Mode of Life Project, I would like to thank Dr Freeland for his support and inspiration as always, and for his permission to allow us to publish some of his articles such as “The Meaning of Holy Tradition” and “Did St Brendan discover America”. We of course sought out numerous pictures in order to insert into the articles so as to clarify and highlight what Dr Freeland wanted to express and teach, and we hope they meet with his approval. Nevertheless I should cite to the reader that this article on the Labyrinth in particular, has now been published by St Andrews Orthodox Press and is entitled “Windows to Orthodoxy”, which is a collection of some of Dr Freeland’s informative and insightful writings. Yet, I believe that some more books should be published, since there are many more excellent works to which Dr Freeland has also written and should have a wider readership. 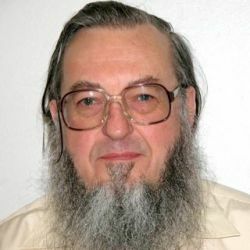 But from Mode of Life Project we once again thank Dr Freeland for his contribution to our humble weblog and to the cause of Orthodox Christian learning and thought.